Synthetic peptide conjugated to KLH derived from within residues 150 - 250 of Human EGR2. ELISA Use at an assay dependent concentration. This antibody gave a positive result in ELISA against the immunizing peptide (ab43767). IHC-FoFr Use at an assay dependent concentration. The antibody has been successfully used in IHC-FoFr on rat sections. However, this is preliminary data and customers may get variable results. Sequence-specific DNA-binding transcription factor. Binds to two specific DNA sites located in the promoter region of HOXA4. Defects in EGR2 are a cause of congenital hypomyelination neuropathy (CHN) [MIM:605253]. Inheritance can be autosomal dominant or recessive. Recessive CHN is also known as Charcot-Marie-Tooth disease type 4E (CMT4E). CHN is characterized clinically by early onset of hypotonia, areflexia, distal muscle weakness, and very slow nerve conduction velocities. Defects in EGR2 are a cause of Charcot-Marie-Tooth disease type 1D (CMT1D) [MIM:607678]. CMT1D is a form of Charcot-Marie-Tooth disease, the most common inherited disorder of the peripheral nervous system. Charcot-Marie-Tooth disease is classified in two main groups on the basis of electrophysiologic properties and histopathology: primary peripheral demyelinating neuropathy or CMT1, and primary peripheral axonal neuropathy or CMT2. Neuropathies of the CMT1 group are characterized by severely reduced nerve conduction velocities (less than 38 m/sec), segmental demyelination and remyelination with onion bulb formations on nerve biopsy, slowly progressive distal muscle atrophy and weakness, absent deep tendon reflexes, and hollow feet. Defects in EGR2 are a cause of Dejerine-Sottas syndrome (DSS) [MIM:145900]; also known as Dejerine-Sottas neuropathy (DSN) or hereditary motor and sensory neuropathy III (HMSN3). DSS is a severe degenerating neuropathy of the demyelinating Charcot-Marie-Tooth disease category, with onset by age 2 years. DSS is characterized by motor and sensory neuropathy with very slow nerve conduction velocities, increased cerebrospinal fluid protein concentrations, hypertrophic nerve changes, delayed age of walking as well as areflexia. There are both autosomal dominant and autosomal recessive forms of Dejerine-Sottas syndrome. Ubiquitinated by WWP2 leading to proteasomal degradation. 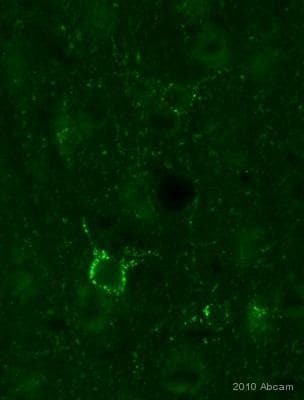 IHC-FoFr image of EGR2 staining on rat cerebral cortex. The sections used came from animals perfused fixed with Paraformaldehyde 4%, in phosphate buffer 0.2M. Following postfixation in the same fixative overnight, the brains were cryoprotected in sucrose 30% overnight. Brains were then cut using a cryostat and the immunostainings were performed using the ‘free floating’ technique. 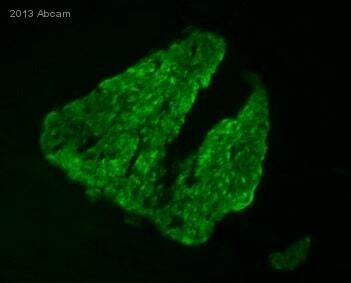 The antibody has been successfully used in IHC-FoFr on rat sections. However, this is preliminary data and customers may get variable results. Publishing research using ab43020? Please let us know so that we can cite the reference in this datasheet.